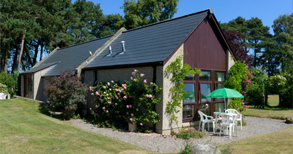 Situated in the Laich of Moray and surrounded by fields and woodland, our two cottages offer you peace and tranquillity but with plenty of activities close by. Winnow and Gable Cottages are set well back from a country road with easy access and spacious parking. Our guests particularly enjoy the lovely walks and the wide variety of wildlife including deer, hares and birds. A warm and sunlit cottage facing south across the barley fields, Winnow has twin beds, a sofa bed if required and a pleasant patio sitting area. Should you wish to book please contact us. 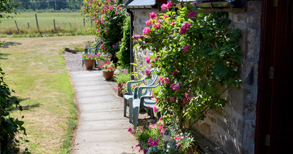 Walk straight out of Gable cottage to the west to enjoy a drink on the patio. With its comfortable double bed and cosy sitting room, Gable is ideal for a couple. Should you wish to book please contact us. For weekly bookings a deposit of £50 is required on booking with the balance paid on arrival (PayPal or cheque).